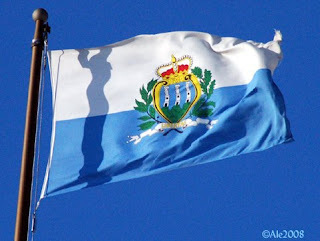 San Marino is the oldest recorded sovereign state, and constitutional republic in the world. It was founded on September 3, 301, by a stonecutter, Marinus of Rab. He went to the city of Rimini, and after the city's persecution of him for preaching, he fled to Monte Titano, where he built a small church, and that formed the basis for the new nation. Because of the poverty of the population, and its inaccessibility, San Marino managed to remain independent. The Papacy, in 1631, acknowledged San Marino as independent, then, during the Napoleonic Wars, its Regent Antonio Onofri managed to befriend Napoleon and impress him. So much so, that Napoleon promised to help San Marino expand its borders should it want to. San Marino declined, stating that in the future, should the nations around San Marino want their land back, they might end up threatening San Marino's very independence. During the unification of Italy, San Marino remained strictly neutral, and provided refuge for people who fled from persecution on both sides of the argument. Mostly people who where opposed to Italian unity, but also some people who where persecuted for promoting the idea of unity. San Marino maintained neutrality and defended that stoutly. Garibaldi was so impressed that he decided to agree to San Marino's request not to be a part of a new Italy, and not to force San Marino to merge against its will. 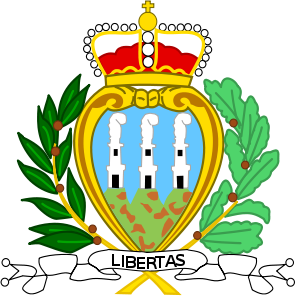 San Marino is also home to the first democratically elected Communist government, who held office from 1948 to 1957, then again from 2006 to 2008. 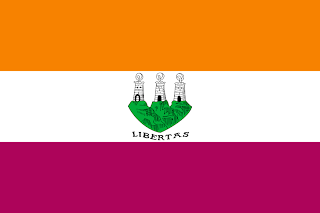 From 1465, to 1797, the flag of San Marino was a horizontal tricolour of orange, white, and purple. The flag itself is charged with part of the coat of arms. The image from the centre of the shield, which are three towers on three hills, representing the three citadels. Underneath, the word, "Libertas." Then, in 1797, the flag was altered. The new flag is a bicolour flag, with a white and light blue horizontal stripe. The civic flag is left plain. And the State flag is charged with the national coat of arms. The coat of arms features a blue shield, with three mountains, and three towers. The towers represent the three citadels of La Guiata, La Cesta, and La Montale. The three hills represents the three peaks of Mount Titano. Under the shield, in a ribbon, is the word Libertas. Literally meaning, Freedom. The shield is surrounded by an oak and laurel branch. These represent the stability of the republic, and the defence of that liberty. The shield is surmounted with a crown, representing the nations sovereignty.